MOCAP High Temperature Polyester Discs (also referred to as dots) are in stock and ready for immediate shipment. Polyester Discs are great for high temperature applications such as powder coating because they resist temperatures up to 425°F (218°C) for 1 hour. For higher temperature masking applications, consider polyimide discs which resist continuous temperatures up to 500°F (260°C) for 1 hour and protect against short exposures over 700°F (371°C). Polyester and polyimide tapes are also available for masking larger areas which discs or dots can't mask. Polyester and polyimide tapes are stocked on wide rolls and can be cut to your specific width and shipped within 1-2 business days upon request. Polyimide is also known by its trade name Kapton™, however MOCAP's polyimide discs are not the Kapton™ brand yet they perform equally as well. MOCAP also offers more discs per roll to reduce inventory, eliminate time for changing rolls and reduced piece price. MOCAP manufactures a full line of masking products including many types and sizes of masking caps and plugs available in silicone rubber, EPDM rubber and high temperature vinyl. Most are stocked for immediate shipment. 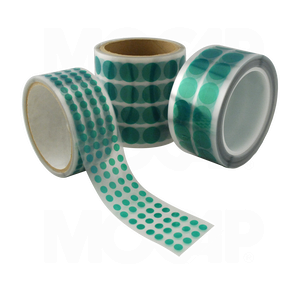 CLICK HERE to view MOCAP's other masking products.